Benjamin Martin did such a beautiful job photographing this wedding, and we are totally swooning over these photos! Can't even wait for y'all to see this one! Kristen and Brett were married at The Barn at Twin Oaks Ranch on May 20, 2017. Their color palette included a gorgeous, bold shade of green, as well as pops of gold and yellow. Their theme was really fun and unique - it was equal parts modern and rustic. It had all the necessities of a rustic wedding, but with enough modern touches to keep it from feeling like a typical rustic chic barn wedding. "We wanted a wedding that was traditional and still modern," Kristen said. "We went with a rustic theme because it fit our personalities well!" This photo of Kristen and Brett's bridal party was the first photo I saw from their wedding, and my jaw pretty much hit the floor. Those gorgeous green bridesmaids' dresses + the lush green landscape + pops of yellow + handsome groomsmen in classic gray suits... heart eyes for dayssss! Kristen's bridal gown and the bridesmaids' dresses all came from The Bridal Cottage. Totally swooning over Kristen's dress - I am really loving the illusion neckline! - as well as those floor length, bold green dresses, which couldn't have been more perfect for a modern, rustic wedding. These bright, rustic florals were definitely one of the highlights of Kristen and Brett's big day! We never, ever get tired of sunflowers, and we love the pop of orange Kristen chose for her bouquets. They were classic, rustic and perfect! "My two favorite flowers are sunflowers and red gerber daisies!" Kristen said. "Our bouquets incorporated both! My bouquet as the bride had the white baby's breath in it as well to make it more unique. They were beautiful!!" We are always suckers for pretty paper details, and these wedding programs were simple but just lovely! "Everything was perfect!" Kristen said. "The forecast for the day was 100% rain but it only rained maybe a total of 2 minutes! We were able to get stunning pictures with all my family and bridal party outside, and the sun even came out a bit! It was definitely everything I hoped!" Even though the weather ended up being nice, Kristen and Brett still chose to get married inside, and their ceremony couldn't have been sweeter or lovelier. Ceremonies inside The Barn are pretty rare, but they're always romantic, dreamy and unforgettable. This one was such a treat! They had a burlap altar with small floral tiebacks and twinkly lights, as well as painted canvases, logs and florals down the aisle. "I'm an artist and so I tried to incorporate my own artwork into the wedding," Kristen said. "I painted canvases for the aisles, sculpted our cake toppers, and made our guest book sign in from an old window. I think they all turned out great! Also our sand ceremony was special as well!" We LOVE it when our couples add personal touches to their weddings! Those details are so special. "I will always remember Brett getting so emotional as I walked down the aisle," Kristen said. "He cried so hard and was so overcome with emotion! It was very sweet and made me feel so special! Brett says he will never forget the moment he first saw me come down the aisle!" Kristen and Brett's reception details were stunning! Their reception tables included white tablecloths, burlap table runners, and modern, minimalist greenery garlands with sunflowers and daisies, which gave them a rustic feel. Overall, their tables were simple and traditional, with the perfect modern-rustic touches! Ohhh, and that cake! Looooove. "I loved the way my cake looked!" Kristen said. "It was perfect! The tables looked great as well. Everything was very classy but not too over the top. 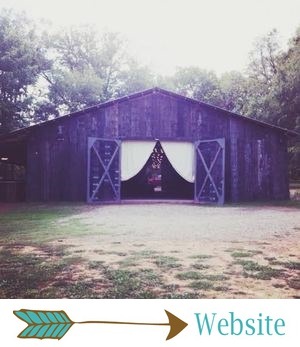 I liked getting married at The Barn because it was so stress free! It all ran so smooth too!" Kristen and Brett's favors perfectly fit with their theme: "We had little flower pots and flower seeds so our guests could let love grow," she said. Cute! I also loved these little pecan pies. Kristen and Brett are leaving for their honeymoon TODAY! They're headed to Cozumel, where Kristen said they plan to scuba dive. We hope you guys have the best time! "They took the time to answer all my questions and provide good suggestions for me and my family," she said. "My planner helped me so much. She was so calm and level headed the entire time! We decided to have my ceremony inside in case it rained and even that was completely stress free!"